Wanting to go Rock Climbing in England? Did you know that rock climbing is one of the fastest growing sports around the world due to the fact that it can be exhilarating, strenuous, challenging, healthy and, of course, fun. If you’re new to it, though, remember that it can also be dangerous so make sure you know what you are doing or take some instruction… it does, after all, come under the heading of extreme sports. This is not a highly technical article, I have frequently chosen a particular crag in this handful I am offering today, merely because the name appealed to me! I mean, how can you resist Baggy Point for goodness’ sake! Stanage Edge, near Hathersage, is the largest and most impressive of the gritstone edges. Gritstone, otherwise known as Millstone grit — is a sedimentary rock composed of coarse sand grains with inclusions of small stones. It is a coarser version of sandstone. The rock is much loved by climbers among whom it has almost cult status and is often referred to as “God’s own rock”. The rough surface provides outstanding friction, enabling climbers to stand on or grip the subtlest of features in the rock. Stanage stretches for a length of approximately 6kms. It currently has over 800 recorded rock climbs with more being invented every year. It’s maximum height is 25m. It can be snowbound in winter. Sadly it is suffering from its popularity, with much of its vegetation being worn away and many of the more popular climbs becoming quite polished through the ascent of many climbers. Thank you to themorfill for this great video of climbing at Flying Buttress, Stanage. High Tor is a lofty 389ft limestone cliff which towers over Matlock Bath and the River Derwent. Climbers are faced with a sheer cliff, but the views from the top are worth it even though the steep drop is dizzying! This is a challenging climb and, at 300+ feet and a good 500+ feet above the valley, there is definately some exposure. Being west facing it can get very hot in the summer, and it’s position up high makes it cold in the winter. There are some excellent classic HVS climbs, but mostly lots of Extremes, especially in the center of the crag. Of the nearly 100 routes here, almost all are worth climbing more than once! The Lake District in Cumbria is the home of rock climbing in England. From the high mountain crags down to the crags in the valleys this area offers unique and spectacular climbs and scenery. Climbing in the Lakes is very popular due to it’s ease of accessibility and the varied climbing within the area. It has something for everyone from the beginner to the experienced rock climber, with climbs passing the V Diff [Very Difficult] to the even more strenuous Extremes Climbs [E+]. There are great hiking trails up Great Gable starting from the dales below. However, we are here to talk rock climbing, not hiking, and there is plenty of that on offer. Great Gable has cliffs to the north (Gable Crag) and south (Westmorland Crags, the Napes, and Kern Knotts). The Napes are important in the history of English rock climbing. W.P. Haskett-Smith’s ascent of the remarkable detached pinnacle of Napes Needle in June 1886 is thought by many to mark the origins in England of rock climbing as a sport in its own right. Those wishing to climb Napes Needle should be warned that a safe descent is far more difficult than the ascent as there are no permanent anchors or bolts to abseil from. Down-climbing is the only way to get from the summit to the shoulder. A relatively simple abseil can be set up to get down from the shoulder. 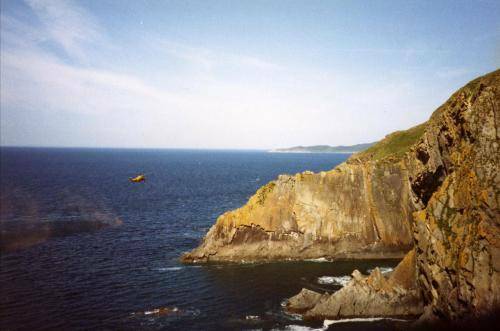 This is probably the most popular crag on the Devon Coast near Barnstaple. It offers excellent climbing on solid, reliable rock. The area consists of slabs reaching 300 feet in places, with about 60 routes in all grades, but tending more towards VS and upwards. The routes are occasionally sparsely protected, but not really dangerous. Remember to keep an eye on the incoming tide, and on a sunny day, you will have an outstanding climbing experience. This area is a rock climbing paradise. Routes of all grades, Mod to E6, and some very technical hard routes. Up to 200 feet long, very sound rock and excellent protection. The whole headland of Gwennap Head has over 100 routes on it, Chair Ladder having more than 80 of them. Parts of the crag are tidal, but escape is possible almost anywhere, making it a very safe crag. Even further south than Land’s End, this climbing destination really is at the extreme edge of Cornwall. The main attraction is the rock and there are challenges here for even the most hardened of climbers. The Terrier’s Tooth is the target for many as it takes you out on to an exposed slab with waves crashing below. So there you go, from the voice of an expert – not me! If you haven’t tried rock climbing and you are looking for something challenging and satisfying, give it a go. You could become hooked. Compared to a gym or organised sports, rock climbing is immensely satisfying, great fun, very exciting and excellent for keeping fit.